After a long hiatus, Mos Def and Talib Kweli descend on Oakland's Fox Theater. Repeating the old hip-hop party cliche "And ya don't stop" is more than just a means of filibustering on the mic. "Ya don't stop" is an old-school principle that expresses endurance and commitment. And "Ya don't stop" was a state of mind for all of the artists at the Fox Theater last Saturday. Normally a two-man operation, opening act Zion-I still had enough stage presence to fill the enormous Fox Theater. That night they were four, with the addition of backup vocalist Codany Holiday and a cameo from bilingual rapper Deuce Eclipse. Emcee Zumbi was infectious, dancing, popping, robo-posturing, and wyling out in a way that emcees don't wyle, anymore — Brooklyn rapper Busta Rhymes came to mind. Holiday kept his hands at his sides like a gunslinger, leaning in and all but balancing the mic on his chin. Producer AmpLive got out from behind the decks, beatbox slung at his waist, and drummed some old-school beats live. And Deuce Eclipse flipped some rapid freestyles. 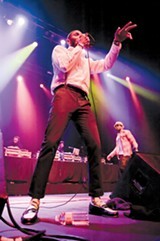 Zumbi's "don't stop" attitude included dedicating "Coasting" to anyone that ever "had to fight for something good." He also led the group through a rousing rendition of "Bird's Eye View," which tells the tale of his commitment to hip-hop in the form of a romantic narrative (à la Common's "I Used to Love H.E.R."). The crowd buzzed through a DJ set by Mr. E, but had grown restless by the time another opener was sprung on them. Irritated audience members didn't want to get friendly with a new face. But the emcee, Curtains, fought through their boos, delivering his "Exodus" — No matter what you think of it/Knowledge the only thing I can chase infinite — and hanging on just long enough to placate the house by name-dropping Oscar Grant, Martin Luther King Jr., and Malcolm X. Fists and lighters went up; Curtains made it off the stage on a politically empowering note. It was enough to make me download his Dope for President mixtape the following day. Mos Def and Talib Kweli, two of hip-hop's most gifted artists, have not recorded an album together since their debut, Mos Def and Talib Kweli Are Black Star, back in 1998. But their partnership hasn't stopped. They deliver quality guest spots on each other's tracks, and to certain backpack rappers you can hardly mention one name without the other. It's like the hip-hop equivalent of Lennon-McCartney, without the animosity. Black Star formed in the violent, chaotic wake left by the deaths of Biggie and Pac. Sad, respectful tributes are a cornerstone of their catalog, and before Mos or Kweli even made it onto the stage, Mos could be heard saying, "Rest in peace, J Dilla." They then launched into a freestyle based around the late producer's favorite adjective, "fantastic." The Dilla tributes don't stop. This show alone featured at least three, including the freestyle and two Dilla productions "History" and "Stakes Is High," made famous by the group De La Soul. Mos Def dedicated "Casa Bey" to Michael Jackson, and the way he was dancing in the lights — in tight, too-short black pants, white socks, and dress shoes — made it look like he stepped out of the "Don't Stop 'til you Get Enough" video. This was followed by two more iterations of the "Don't stop" mantra: a soul clap-along with the hook "Don't Stop" and a brief cut of McFadden and Whitehead's "Ain't No Stopping Us Now." Unfortunately, the distractions just wouldn't stop either. There were three DJ consoles set up behind Mos and Kweli: J. Rocc of the World Famous Beat Junkies was flanked by un-named DJs on either side. Some technical issue kept the left console out of commission for most of the show, and whatever orchestrated turntable routine might have been in the works, we never heard it. This wasn't only disappointing, it was annoying, since Mos and Kweli took turns trying to fix the console and inevitably missed cues. Even worse, mic vocals ricocheted around the Fox so badly that at points, the two of the best enunciators in the game were left sounding as though they were spitting through car mufflers. If you didn't know the songs by heart beforehand, you weren't going to learn them on this occasion. These factors contributed to the disjointed feeling of the set, which rarely gained much momentum and was frequently weighed down by alternating dead air and pointless interludes. But when the set was cooking, it was killing. Talib Kweli's punchy "Get By" came on the heels of Mos Def's smooth and introspective jazz joint "Umi Says" for a terrific one-two punch. "Re:Definiton" drove the crowd to ecstasy, especially when the Black Star mission statement, "Definition," drops into the reprise. The show clocked in at a lengthy two hours. Ten minutes into the encore, when Kweli said, "We just getting started," I was thinking of the show-biz axiom "Leave 'em wanting more." But Kweli was just introducing their recent collaboration "Just Begun." If Black Star's "just begun" twelve years after they started, maybe a follow-up record is in the pipeline this decade. It seems like a long time since Black Star came together, but with that "don't stop" attitude, time loses all meaning. Like they say on Black Star's "Re:Definition," I said, one, two, three/Black Star shine eternally.